EZ-Shampo® Deluxe Basin Designed for comfortable and convenient in-bed shampooing. Made of heavy-duty vinyl. Includes custom drain stopper plug at base and flexible drain hose. Inflates to 24" W x 20" L x 8" D. Designed to be lightweight, portable and compact for convenient storage. 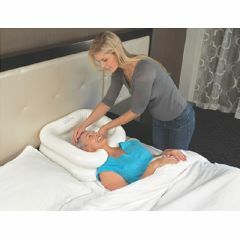 Special design with inflatable headrest provides secure, form-fitting support to cushion head and shoulders. 1-year warranty. Comes complete with drain hose and stopper. This has been the only way i can wash my mothers hair. she is totally bedfast. It works quite well although the drain hose has to be kept unbent and thats a little hard to do while its laying on the bed. I am very pleased with the product it works much better than those waterless shampoo caps which doesnt clean very well. The problem I had with this product is that the back end of the basin lifts off the bed with the weight of the head. The water would then run towards the front and spill out the area where the cut out for the neck is. It needs something to hold the back side down when you put your head in. The slow and somewhat difficult drainage during use is not too much of a big deal. I would recommend this product if you don't mind rigging up a way to keep the basin from tilting with the weight of the person's head. Use this product on our disabled daughter. It's easy to inflate and easy to clean. Lightweight. Safe. Sturdy. Functional. Easy To Install. my wife is bed bound use it to wash her hair. by mike the care giver. from hanover michigan. Lightweight. Safe. Functional. Easy To Install. this item was perfect.i have been looking for a portable shampoo basin for ages and had not been able to locate one until now. Have a basin for my husband, it works fine but the hose is crimped and has never straighten out, hard to let water out, what is the hose like on this one? what I do is put a plastic basin under th bed and run the hose down to to the basin between the top of the mattress and the headboard, you just have to make sure the hose is setting in there good so it doesn't fly our.Then I dump the basin but I have never had trouble with the hose draining or kinking. Try warming the drain tube with a hair dryer or some hot water and work the kinks free. The drain tube will then run freely when placed properly.